…and another whirling couple of weeks for me. Do you have those days when you think you have something in the palm of your hand, but really its only in fingertips reach…I know in my mind that lifes little triggers of wisdom come from lifes lessons, we grow stronger, we find our inner selves and voices, and striving for that new job, that new creative thread…these lessons make us grow and become a stronger person. The road is never ever straight, its winding with crossroads, and if we take the wrong turn, we need the courage and strength from the lesson learnt to turn around and start again. Pick up the pieces…and start again. This challenge with Kim was to use one of her fabulous textures: ‘felicity’. It came to mind the Italian word felicità which means joy, happiness and picking these mulberries fresh from the tree was just that. A happy time, full of giggles and laughter, climbing ladders and eating these little morsels of sweet joy. Yes, your absence did not go unnoticed…glad you’re back. 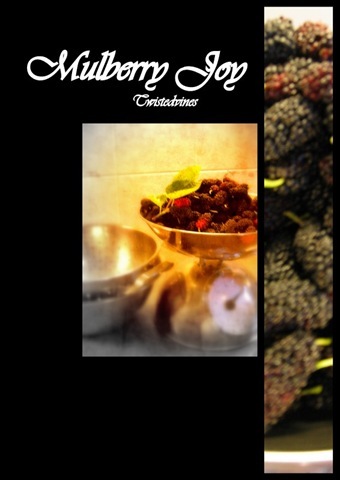 I don’t think I’ve ever had mulberries. They sound delicious, and your photo makes them even more so, and tempting. Beautiful warm golden glow of the ‘challis’ like container against the crimson berries. Delightful! You are doing great with the Kim Klassens!! Love this style. I do love mulberries. I had one in my back yard a few years back, but had to have it removed. The berries were oh so sweet.